The perfect sidekick for playing gigs, recording in studios and practicing at home. 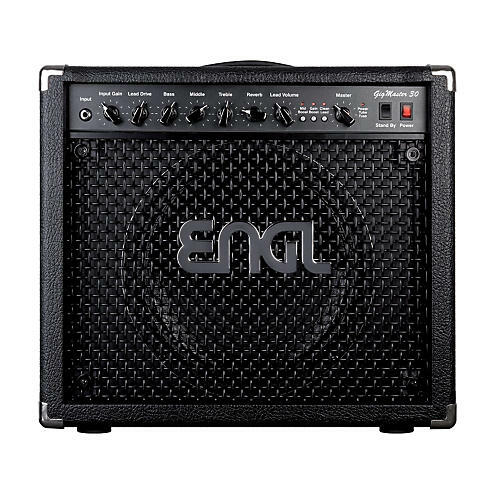 The ENGL GigMaster 30 tube guitar combo amp is a compact tube-driven combo that delivers to-die-for tone in a phenomenally portable package! It comes loaded with sound-sculpting features designed to make playing more rewarding, including a built-in spring reverb, Gain Boost and Master Volume Boost. This M.V.B. lets you access two different master volume levels on the fly via footswitch, for example, one for rhythm and the other for leads. Four EL84 pentode power tubes serve up the amp's sweet fundamental sound, while the preamp's ECC83 double triode unleashes loads of overdrive and distortion. What's more, the GigMaster 30 sports two channels, Clean and Lead, so you get a wider variety of tonal flavors. The Gig Master 30's Mid Boost switch accentuates those middle frequencies. Sound-shaping can be controlled remotely via footswitch, which gives you lots of tonal flexibility paired with utmost handling ease! This ingenious little amp is sure to delight with its warm, bluesy tone and assertive mids. But don't take our word for it - plug in, play, and enjoy! Take a sonic ride with this wailing lil combo at your side!